Winter's cooler temperatures and lack of vegetation forces wild rabbits to spend more time in search of food. They often seek shelter in underground dens they have lined with grass, straw and twigs as insulators. Domesticated rabbits living in outdoor hutches rely on sensitive human companions that remember to provide additional protection from wind, rain and snow. During extreme cold temperatures -- below zero -- it's best to move domesticated rabbits inside. As noted by Fish and Game Magazine, the once abundant food supply wild rabbits enjoy is decimated by the onset and continuation of winter. Lush vegetation is withered away. Most of the clover, tender young plants, berries and vegetables are gone or difficult to find because they've already been consumed. Wild rabbits resort to eating woody plant parts including the twigs, bark and buds of trees and bushes. Penn State University explains the rabbit's year-round habit of eating their own pelleted feces becomes even more important in the winter months. Rabbits do so to extract additional nutrients because their digestive systems aren't particularly efficient. The winter months aren't tough on wild rabbits solely due to the lack of food. This is the time when humans and other animal predators target them as prey. Game and Fish Magazine states that wild rabbits are hunted in the winter months by house cats and bobcats on the ground and by hawks, owls and other feathered predators from the sky. 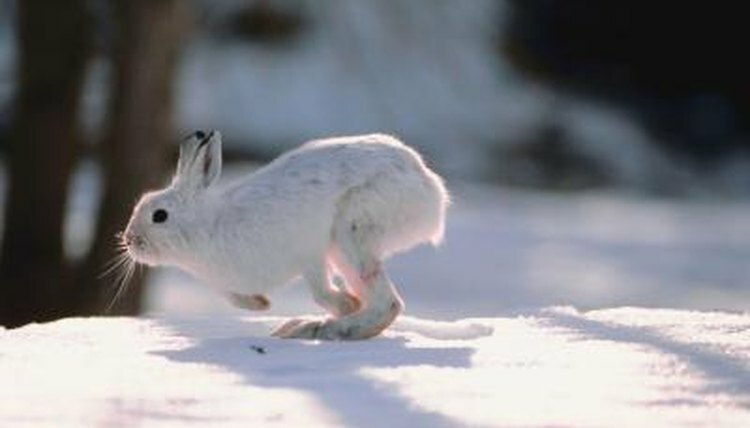 Add people with shotguns, and wild rabbits face a variety of threats to their chances of surviving until the onset of spring. The thickets and bushes rabbits hide amongst are reduced to bramble with no vegetative covering during winter. It's tough to hide just among stems and twigs. Brush piles and hollowed-out stumps and logs become effective refuge. Some rabbits change color to blend in with the predominantly white and gray landscape. Rabbits also stay put in cold weather to conserve energy. Game and Fish Magazine discusses how hunters walking too quickly in colder temperatures often don't spot rabbits that are in a holding pattern. The Verlannahill Rabbitry states that rabbits can withstand cold much better than excessive heat. That's good news for keepers of domesticated rabbits in outdoor hutches. Rabbits can easily tolerate temperatures hovering at the freezing mark -- 32 degrees Fahrenheit -- or below provided they are sheltered from wind and wet. Use extra straw or other bedding to completely insulate one section of the hutch where your rabbits are protected. Do not enclose the entire hutch as rabbits do require fresh air. According to Verlanna Hill Rabbitry, moderately cold weather invigorates rabbits bringing out their naturally playful nature. The Pets At Home website suggests providing a variety of toys to engage your rabbits. While there are plenty of toys available for sale at pet stores, you can also make your own rabbit toys. Cut some holes in a cardboard box, place it in your rabbit's enclosure and watch them hop through the holes. A box filled with hay or shredded paper is also suggested to let the rabbits practice their digging habit. What Are the Instincts Rabbits Use to Survive? Can a Rabbit Sleep Outside?